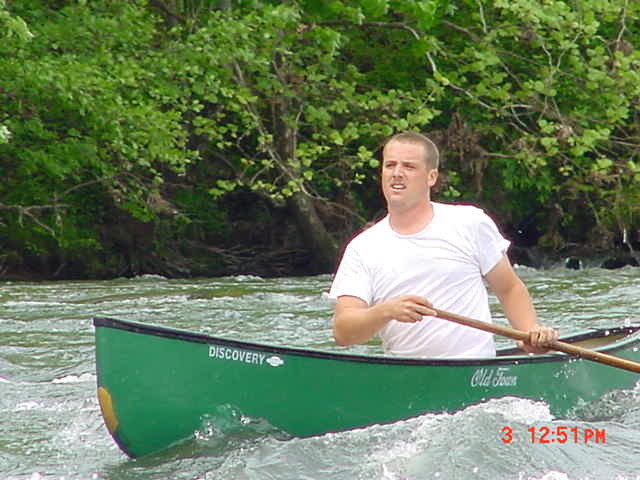 Kirk Havens won the 2002 Outstanding Paddler Award with the fastest solo canoe time last year. 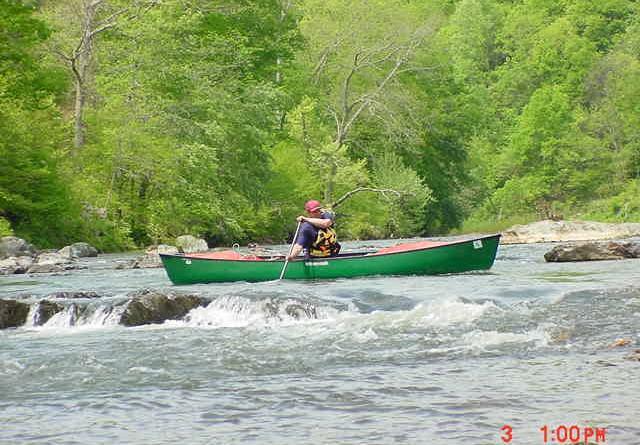 He again achieves the best solo time, this year in a Kevlar Formula-14 racing canoe. 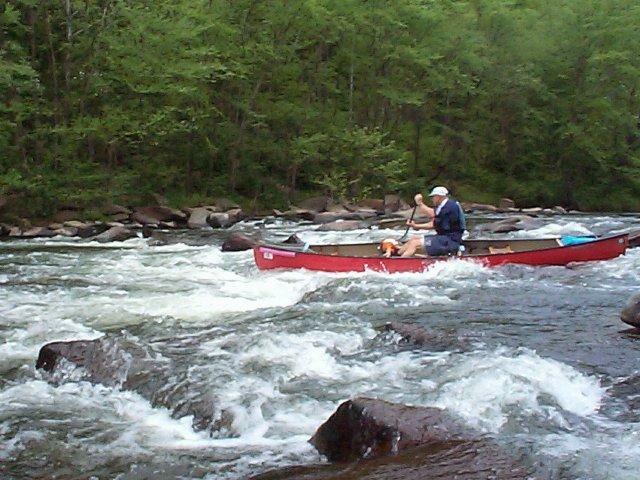 Ed DeMasters takes an unconventional route on river-right. 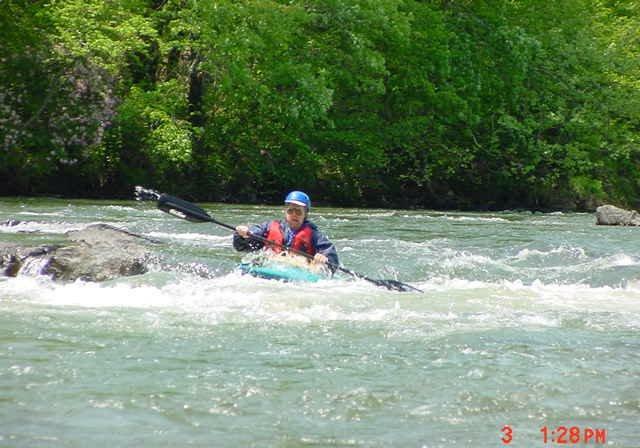 Ed took second place in the under-45 kayak class. 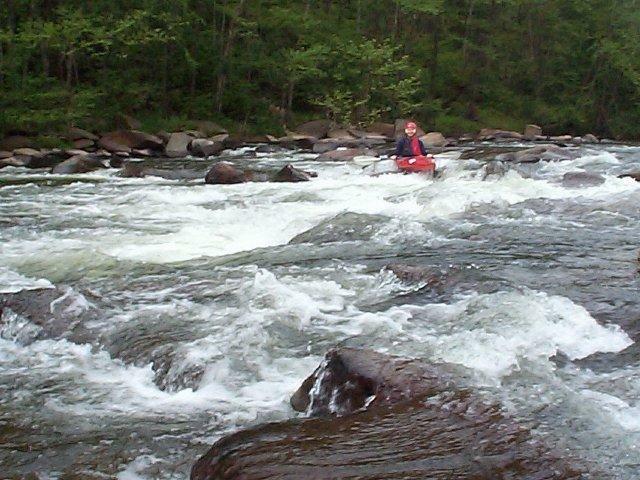 Dave Perault takes a perfect line and finishes with the best kayak time of the day. 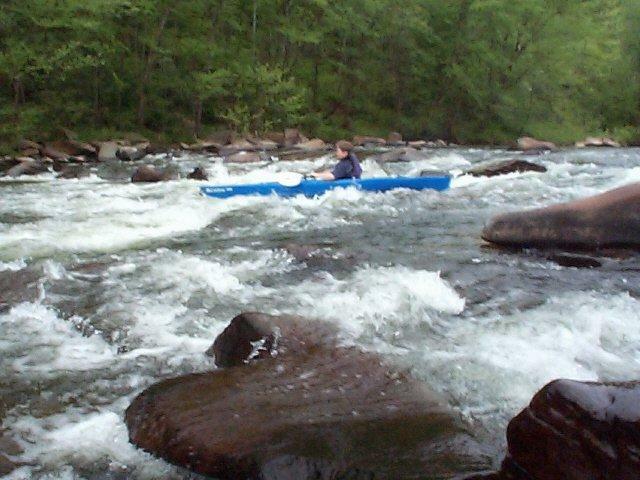 Andy Quada looks smooth and sleek as he balances his paddle. 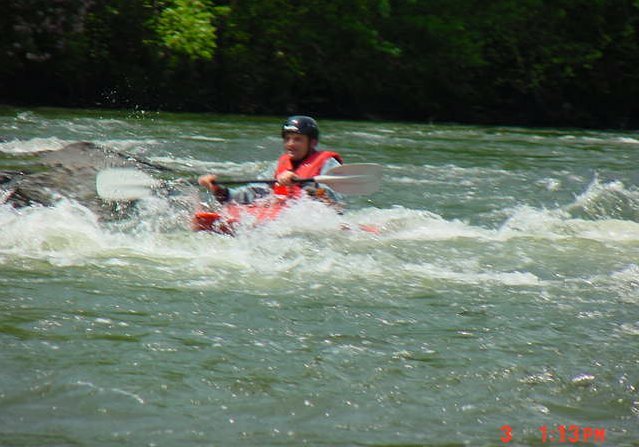 Andy took third place in the kayak under-45 division. Billy Orme comtemplates his next move. 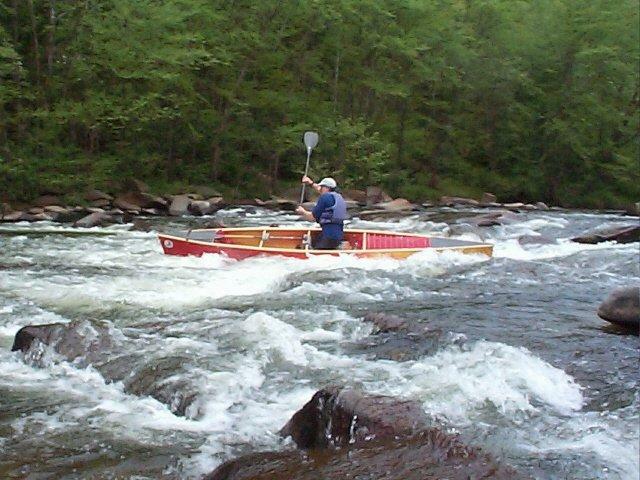 Dave Thomas is steady in the high seated position used by flatwater paddlers. 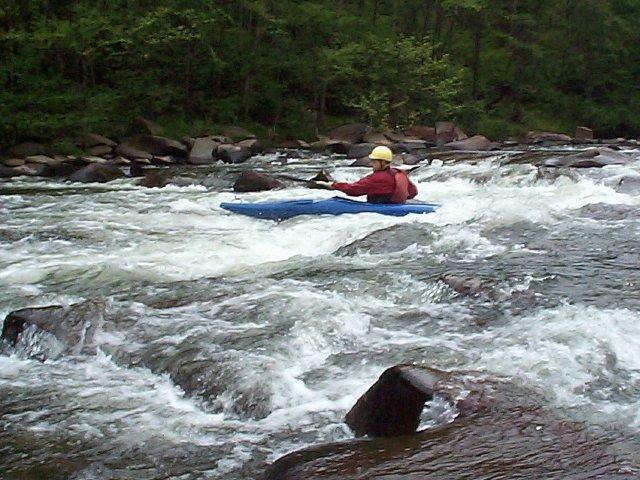 Dave demonstrates a hydration system popular with long distance paddlers. Dave finished third in the highly-competitive OC1 Male class. 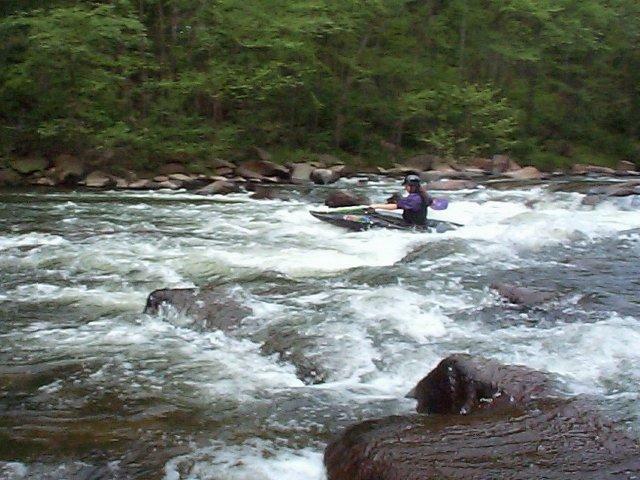 Carol Tucker eases through a slot in "rock-pile" rapid. 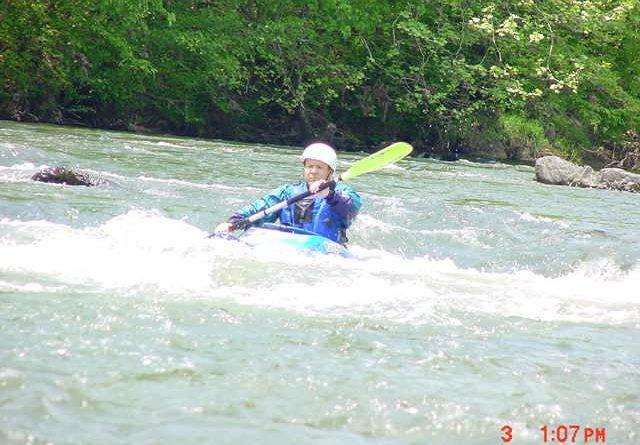 Carol turns it on to hold off an advancing kayaker. 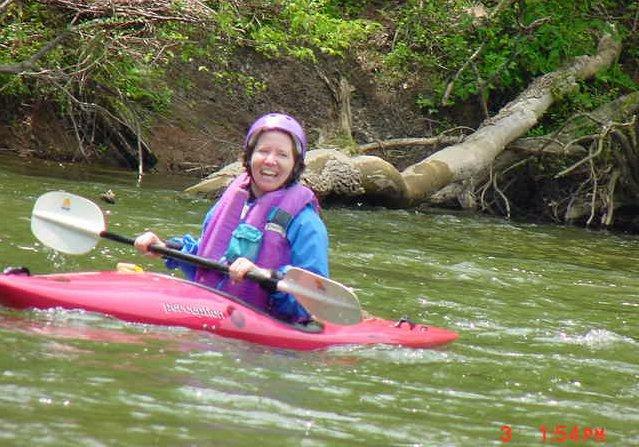 Carol finished second in the competitive Women's Kayak Division. 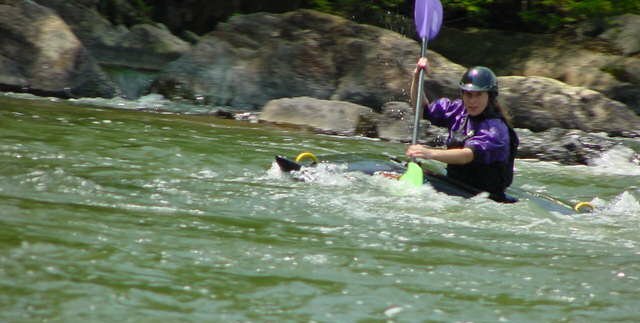 Dan Tucker finished second in the Youth Kayak Division. Dan's medal was one of four captured by the Tucker family this year. 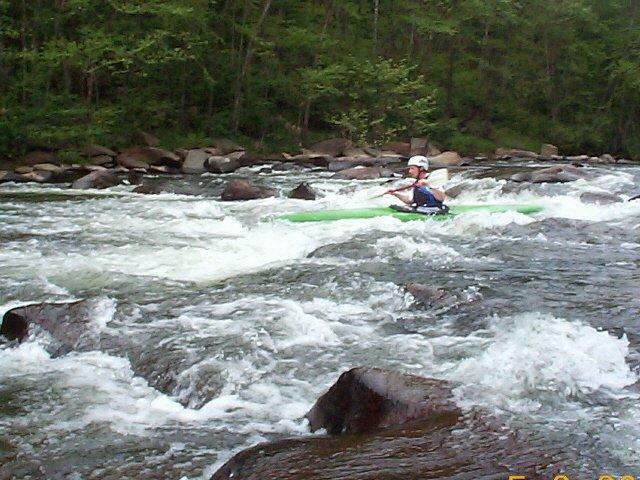 Youthful confidence takes Drew Tucker through a difficult rapid. Up close and personal, Drew poses for Nelson County Sports On-Line. 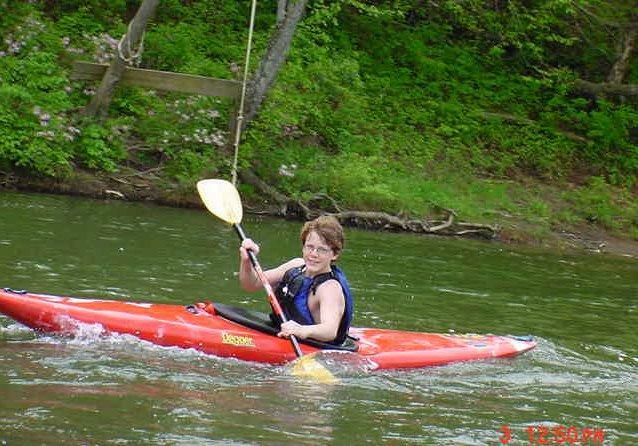 Drew finished first in the Youth Kayak Division beating the times of most adults. 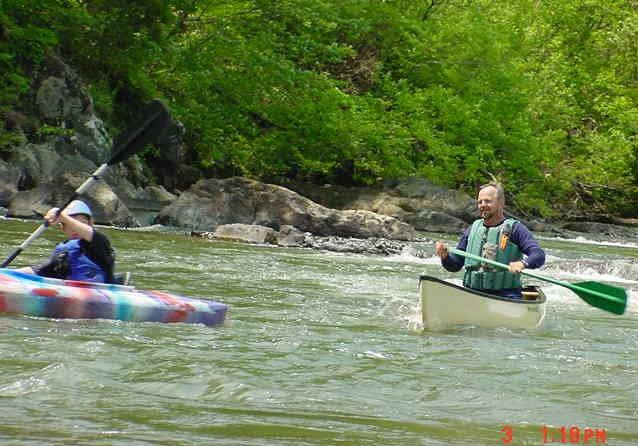 Banjo player extraordinaire, Jimbo Carey shows he can play a kayak as well. 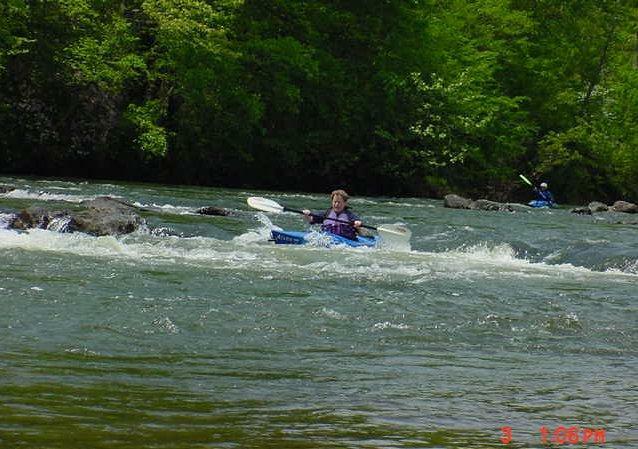 Jimbo finished third in the over-45 Men's Kayak Division. 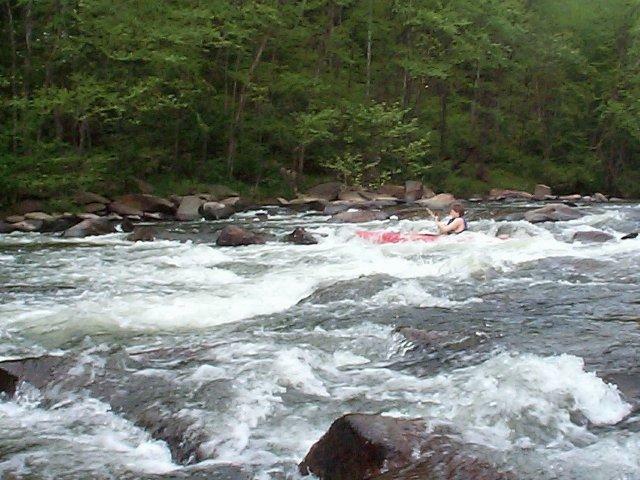 Jimmy Roux buries his stubby, whitewater playboat in a foamy rapid. Karen Firehock slides over a rocky ledge. Karen, you're taking this race way too seriously. 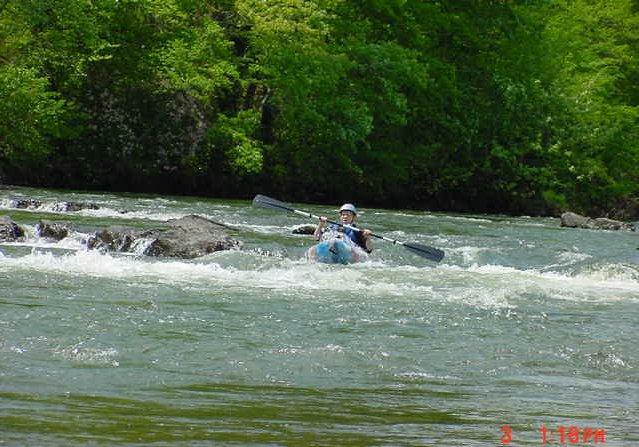 Karen finished third in the Women's Kayak Division. 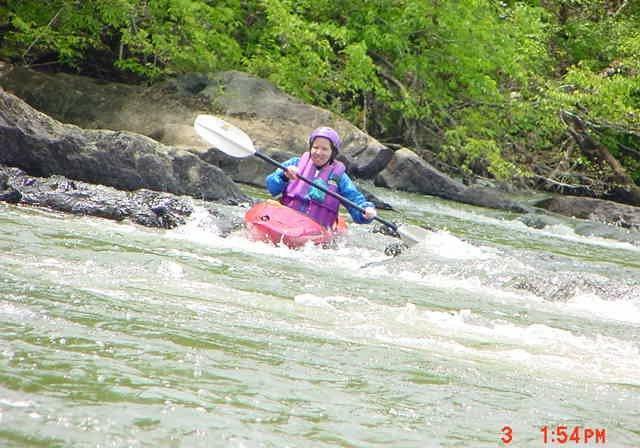 Nikki Chambers flies on her way to a first place medal and the Oustanding Paddler Award for 2003. A closer look at the Purple Passion. 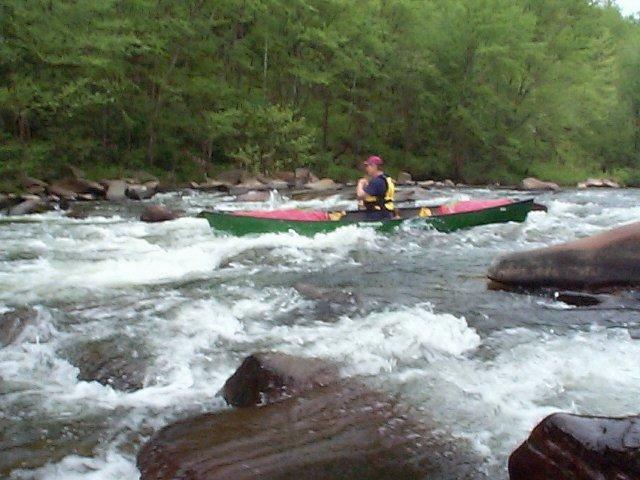 Nikki's multicolored paddle got a few looks as well. Ron Ashmore makes a splash in his new orange playboat. 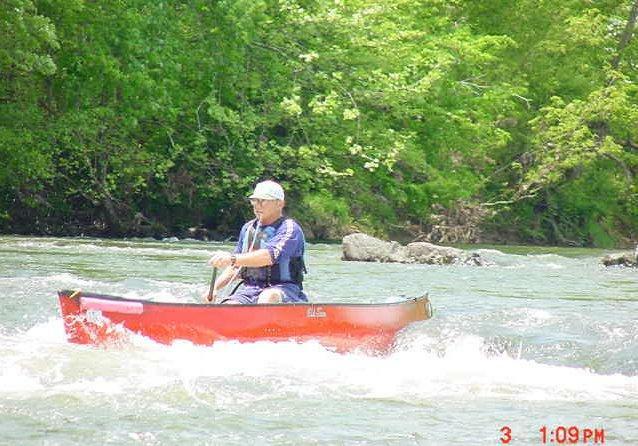 Ron finished second in the over-45 Men's Kayak Division. Ronnie Tucker chases his son, Dan. In the early morning run Ronnie took the gold medal in the over-45 Men's Kayak Division. Herman Schlimmer locks onto a good route. Herman decides to make a detour half-way through the ledges. Herman finished fourth in the highly competitive OC1 Men's Division. 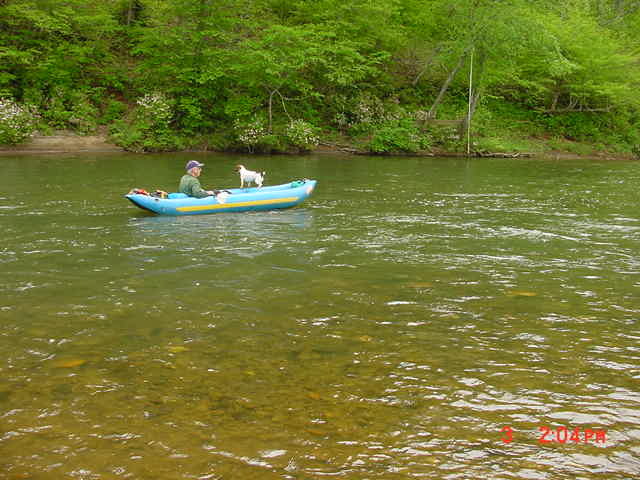 Vernon Powell, whitewater photographer and Veep the Wonder Dog kick back after a hard day's work..